Yep, another Berenstain Bear book... because you know I love and so do my kids! This summer in children's church we walked through the fruits of the spirit so this book was very nice to have to go along with it. 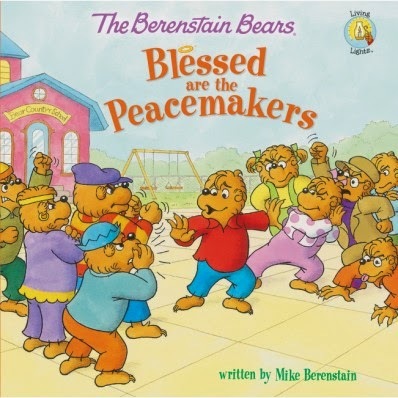 I think I have reviewed a half dozen or so of the Berenstain Bear series and every time you will find a positive review. My kids have fallen in love with the characters just like I did when I was a child. I don't remember as many faith based ones as I do now bu either way I have always been a huge fan. This book fit in nicely with our fruit of the spirit lessons at children's church. I love when a children's book provides a problem and an easy solution for kids to figure out even if you pause before reading the story. Not only could we discuss the fruit of the spirit peace, but since this book deals with bullying we were able to discuss this in further details. Bullying seems to be a national epidemic and as a mother and a school teacher I am always trying very hard to make sure it is not an issue for my kids or my students. My son is only 3 years old but he has been picking on a younger girl at daycare so it was vital for him to hear this story. My daughter is in first grade so talking about problem resolution was a big topic and something we will come back to often. Any parent who is trying to find books that will provide good discussions then BUY this book! Thanks Zondervan for providing me with a copy of this book to conduct my review. I was not paid for this review and all opinions are 100% mine.